Raving reviews on the Red Queen have been flooding my news and social media feeds since before it launched. When it finally got to the top of my TBR pile, I was so excited. This book is fast paced and intense. It definitely lived up to the hype. Had it not been for my need to sleep, I would have inhaled it in one sitting. The Silvers are the privileged bunch in this story. Their Silver blood entitles them to power, money and strength in the form of abilities. I'm a huge Marvel fan with the X-Men living pretty high up on my list. Many of the Silvers' abilities mimic those of some of my favourite mutants. Some Silvers can manipulate metal like Magneto, read minds like Jean Grey and have the ability to heal themselves like Wolverine. The Reds on the other hand are at the bottom of the caste system. They are employed as labourers, servants and soldiers. This story is full of amazing action scenes, mystery and a love triangle... or is it square? It's more a like an oddly shaped pentagon... In any case, Red Queen is an enjoyable read. If you're looking for the next trilogy to geek out on, this is it! Can't wait to see what's in store for Mare and her friends in book two. 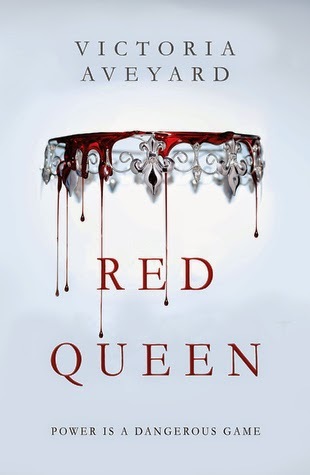 Have you read Red Queen? If you were a Silver, which ability would you have?